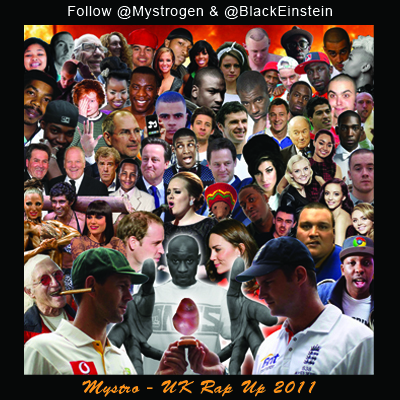 Mystro (@Mystrogen) – UK Rap Up 2011 | "Up to date / state of the art / take part, get taken apart as I make my mark"
I’m mad late on this as I’ve been away, but for those of you that might have missed it, and lets face it, thats probably not a lot of you, here’s Mystro’s annual take on the events that happened on this island in the 365 days that we’ll know as 2011. Produced by Black Einstein. This entry was posted on January 15, 2012 by Koaste in Live From The UK and tagged Black Einstein, Mystro, Natural Born Spittaz, UK Rap Up.